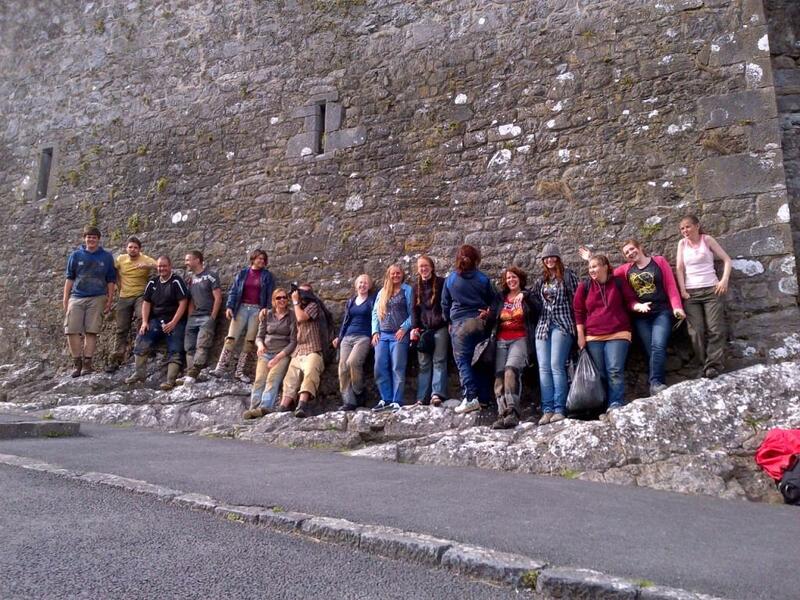 The Rathnadrinna Research Project involves the investigation of this important fort in Cashel, Co. Tipperary, Ireland. 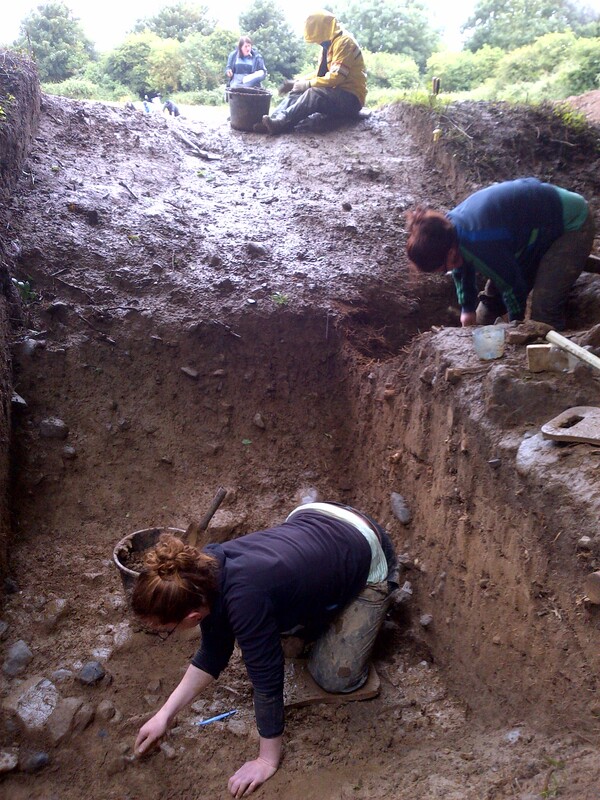 The Season One Excavation of Rathnadrinna Fort, Lalor’s-Lot, Cashel, Co. Tipperary commenced on June 11th and concluded nine weeks later on August 10th 2012. 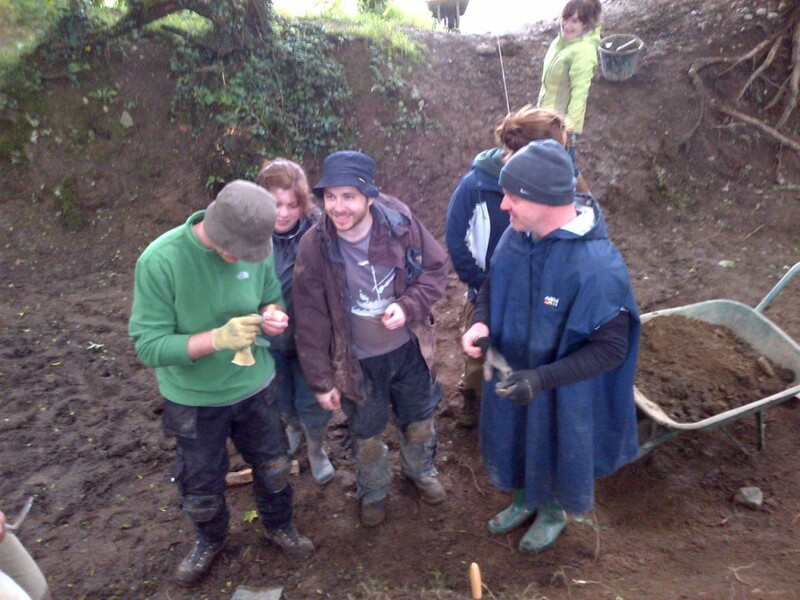 All excavation works carried out under licence number 12E157 were funded by the Royal Irish Academy under their Research Archaeology Grants. A Metal Detector was used on site under licence number 12R64. 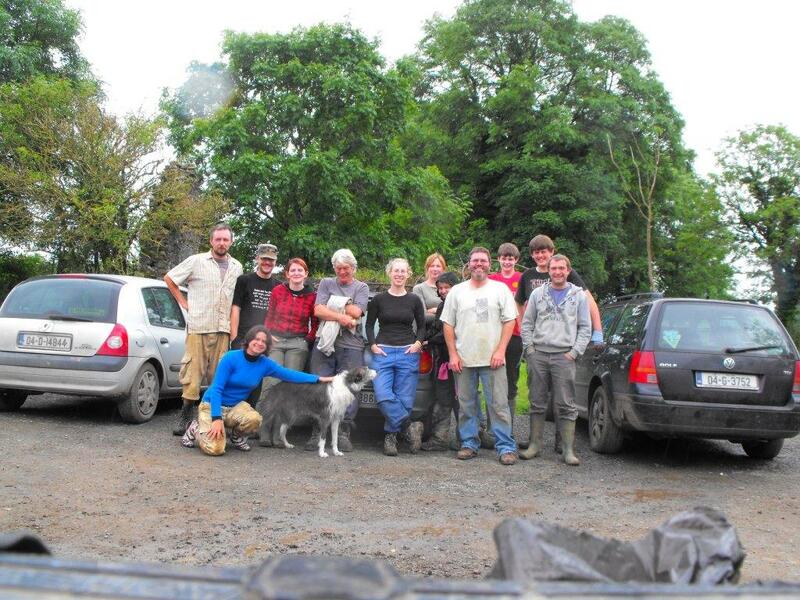 Season Two Excavation will commence on July 15th 2013 and run for five weeks, specifically focusing on completing the recording of features left unfinished in 2012. Subject to funding, it is intended to conduct three seasons of excavation on Rathnadrinna Fort, representing the first time one of Cashel’s upstanding monuments will be investigated solely for research purposes. At the conclusion of the post excavation works the results will be published. Location: Rathnadrinna Fort is a multi-vallate, circular hilltop enclosure (RMP TS061-089001) situated in Lalor’s-Lot townland, 3.33 km south-southeast of Cashel. The hilltop affords the fort extensive views across the adjacent low lying land and is inter-visible with a number of high-status forts surrounding the Rock of Cashel, to the north. Approximately 20 m northeast of the entrance to Rathnadrinna Fort is a smaller fort (TS061-089002), located in a field to the north. Rathnadrinna fort is the largest and best preserved of Cashel’s forts, and research here presents an ideal opportunity to learn more about the evolution and function of such forts in a royal landscape – Cashel of the Kings. Geology: The bedrock geology of the site is comprised of the Ballyadams Formation, crinoidal wackestones and packstone limestone. Limestone is magnetically quiet and has provided a reasonably uniform magnetic against which magnetic anomalies can be easily identified. The dominant soil type is the grey brown podzolic which are fertile, well-drained soils ranging in depth from 0.20 – 0.50 m. It is an excellent soil type for agriculture, in particular horse breeding, for which this area of south Tipperary is renowned for. 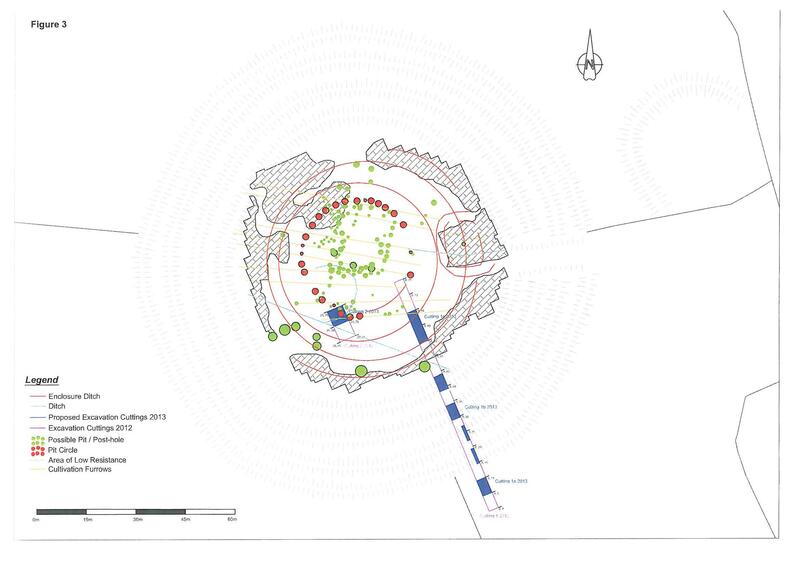 Site Description: On inspection, Rathnadrinna fort reveals itself as an almost perfectly-formed circular enclosure, measuring 140 m in external diameter, and approximately 90 m between its internal banks. The interior of the fort, an area of approximately 0.6 hectares is generally flat with slight rises at the northeast and southwest corners. The eastern side (to the south of the entrance area) is slightly water-logged and is the most low-lying portion of the site, apart from the ditches. The banks and ditches are extensively covered with trees and low-lying vegetation. On the western side of the fort, the inner ditch measures 4m wide, with the banks on either side varying between 2.5 – 3 m wide and 1 – 1.5 m high. The middle ditch is 3 – 3.5 m wide and the outer ditch is over 5 m wide. The latter terminates against the large bank, stone-faced on the inner side. On the eastern side the innermost ditch measures 3 m wide with the banks on either side varying between 2.5 – 3 m wide and 1 m high. The middle ditch is 3 m wide with the bank on its eastern side being 1.3 m high. The outermost ditch is 4.5 m wide and abuts a large bank stone-faced on the inner side. The bank itself is 2.6 m wide and 1.5 m high; where it survives best the stone-facing reaches to 1.8 m high. The stones are well-covered in moss and lichen growth. There are traces of stones throughout other parts of the ramparts that may also have been faced with stone. However, the northern and southern portions of the banks are so densely covered with vegetation and trees in places that access is almost impossible.Undoubtedly, the banks would have been higher and ditches deeper but constant movement of cattle has added to their denudation and silting up. It is also apparent that the banks are interrupted along their length in a few places where short gaps exist through them. The nature and date of these gaps is unknown but similar gaps are also found in other forts such as Garranes, Co. Cork (O‘Ríordáin & Ryan 1942). The entrance avenue is on the east, c. 25 m long and has a low ditch running on each side aligned perpendicular to the fort banks – perhaps keeping the avenue clear of slippage from the banks? Approximately 20 m northeast of the entrance to Rathnadrinna Fort is a smaller fort (TS061-089002), located in a field to the north, and currently does not form part of this proposal. The northwest corner of the site lies at Ordnance Survey of Ireland Irish National Grid (ING) Reference E208535 N137790, on top of a hill at a height of 122 m above Ordnance Datum. 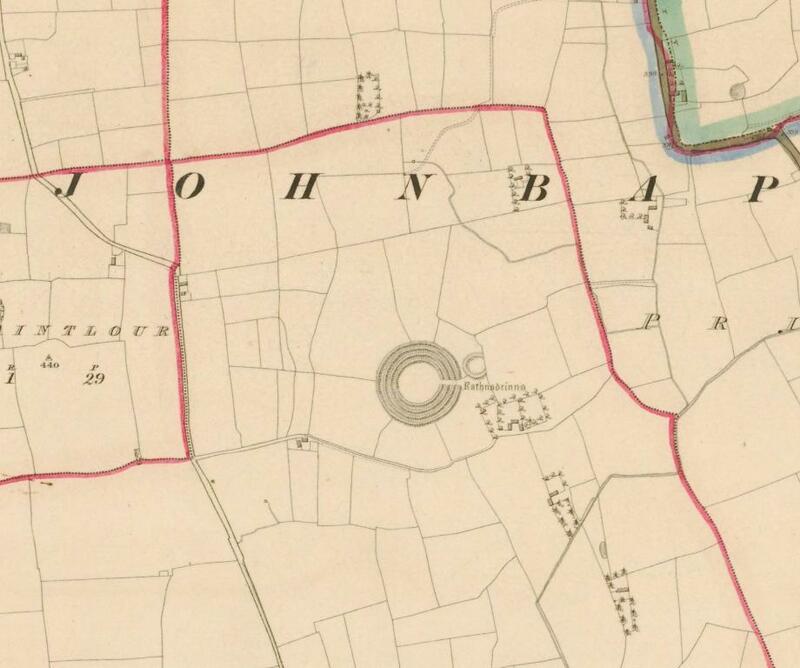 Site History: The townland of Lalor’s-Lot was located within the vast tract of land known as the ‘Commons’ of Cashel, said to have originally contained 4,000 acres and in the ownership of Cashel Corporation until the middle of the 19th century (Dalton 1994, 165). 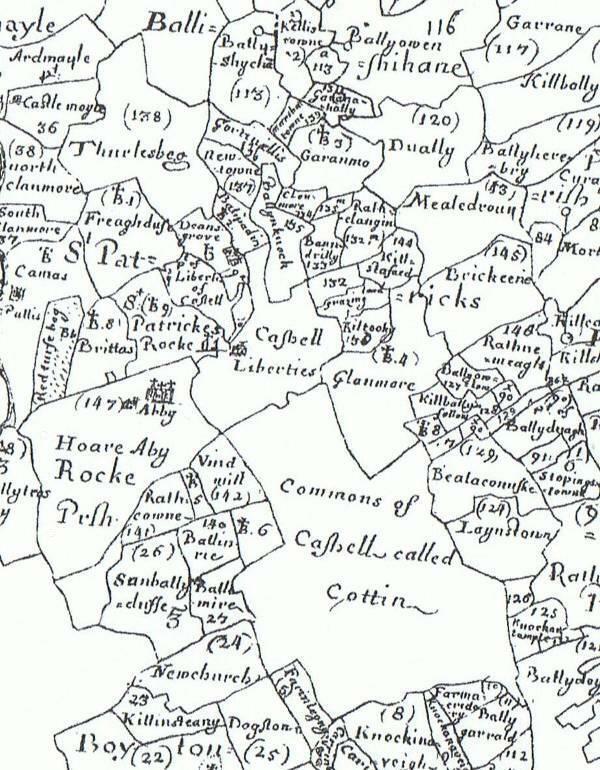 On the Down Survey map of 1656 the ‘Commons’ is called ‘Cottin’ and Rathnadrinna is not depicted. 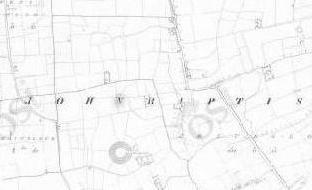 On the Civil Survey for this part of County Tipperary there is no mention of the fort although the physical boundaries of the ‘Commons’ are detailed. It is only on the 1st edition OS six-inch map (surveyed and information collated in 1839) that Rathnadrinna is first depicted. 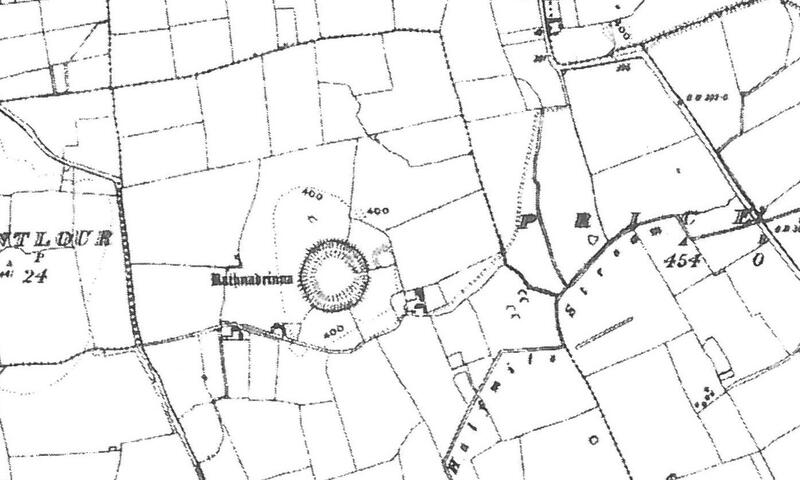 In the Ordnance Survey Namebooks O’Donovan described it as ‘Lalor’s Lot [Phelan’s or Lalor’s Lot] – Is all tillage and pasture; here is a remarkable fort called Rathnadrinee, with four concentric and very perfect parapets…Rath-na-drine, fort of the contest, Rath-na-drinee, Rathnadrinna’ (O’Flanagan 1932, 112 & 116). Westropp (1902, 697, Figure 23) illustrated the fort calling it Ath nadrinnagh: the same drawing and name were replicated by Feehan (2003, 64, Figure 3.4). The name Ath nadrinnagh is not local and one wonders where Westropp got the ‘Ath’ from – it’s not native to Cashel – especially as he spelt the name ‘Rathnadrinnagh’ in his references section? Did he simply misplace the ‘R’ in the title? On the SMR Files in St. Stephens Green two aerial photographs are listed – an oblique Cucap image (A0Z 85) taken on the 13th July 1966 and a vertical image taken on the 16th April 1974 by the GSI. 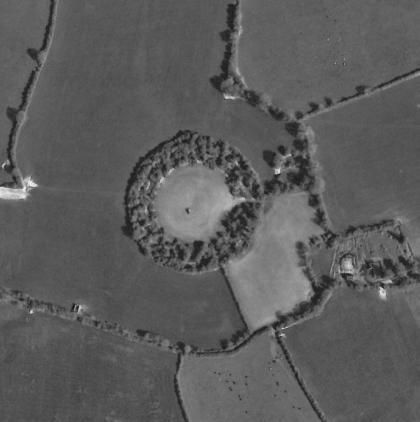 In 1975 Reynolds in her survey of Tipperary South Riding [as it was then known] described the site as ‘…ringfort / enclosure, small enclosure to N. of Rath’ (Reynolds 1975, 70). The first scientific survey of the site was conducted by Mary Cahill in her ground-breaking study of the Barony of Middlethird. Rathnadrinna is listed as ‘R289’ and described as ‘…very good condition, three banks, 3 ditches, entrance very well defined on W [E] side, Dimensions 90m’. The satellite fort is listed as ‘R290’ and described as ‘…in fair condition, one bank, dimensions 25m’ (Cahill 1982). 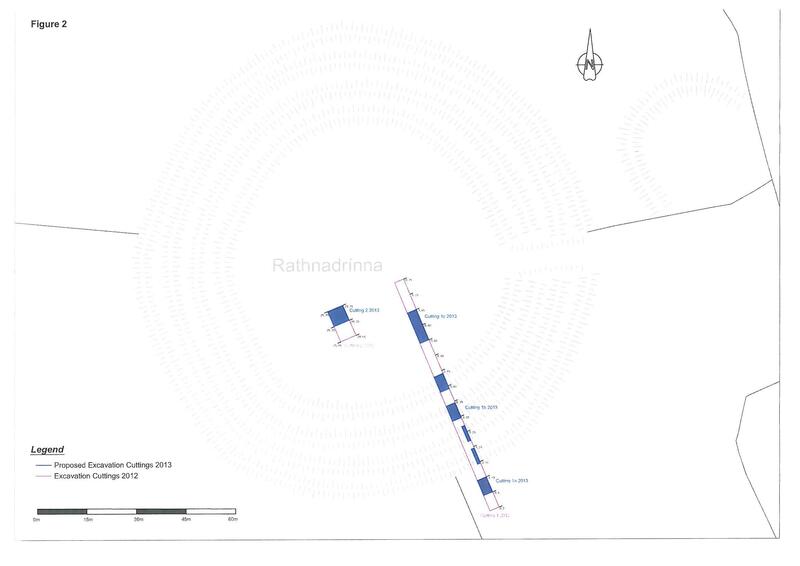 In 1985 Rathnadrinna was described as a ‘… [a] more complex multi-ramparted site…’ and was listed within the section of Iron Age habitation sites (Raleigh 1985, 27). In 1994 Rathnadrinna was equated with the famous site of Ráthbreasail, the location of the great church synod of 1111. Here the spelling was given as ‘Rathnadrinagh’ and a royal origin for the site was proposed, on the basis of its’ size (Dalton 1994, 170). From the seventh century AD Cashel was synonymous with the Eóganacht dynasty (late 4th/early 5th to late 10th century), the Uí Briain (late 10th to late early 12th centuries) and Meic Carthaig (early 12th to late 12th century). Rathnadrinna has been associated with the inauguration site of the Kings of Cashel and Munster known as Rath na nIrlann [Lis na nUrlann] (FitzPatrick 2004, 179). The exact reference is contained within the Yellow Book of Lecan and reads – ‘It is in this wise that the kings of Munster be elected…he should be brought to the Stone of Cothraige [Patricks Rock], and Cormac’s great church [Cormac’s Chapel] and there proclaimed king and be brought to Lis na nUrlann in Cashel and proclaimed [there also]’ (Ó Riain-Raedel 2006, 177). This is tantalizing evidence for a royal association between Rathnadrinna and the Rock of Cashel from the mid / late 12th century. In 2012 Professor Padraig Ó Riain postulated that the name ‘drinne’ may derive from ‘drom’, signifying assembly / meeting area: a translation such as ‘fort of the contest’ was incorrect (P. Ó Riain pers comm). This raises the possibility that Rathnadrinna may have functioned as an Óenach site – see http://theoenachproject.wordpress.com/2012/03/28/117/ Due to its sheer size, complexity of design and prominent location (on the southern approach to Cashel) a royal function for Rathnadrinna is justified (O’Brien, Gimson & Bonsall 2011). 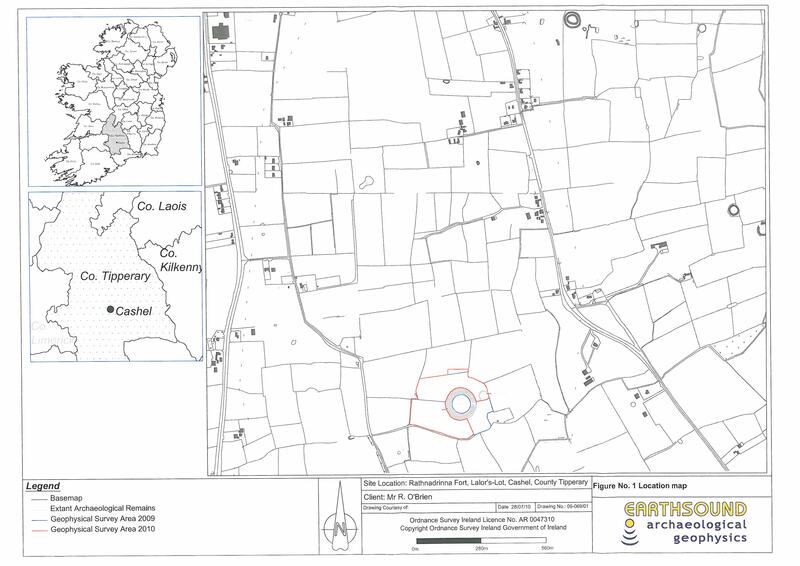 Summary of Geophysical Results 2009–2010: Between 2009 and 2010 geophysical surveys funded by the Heritage Council of Ireland were conducted within the interior and exterior of the fort. In 2009 the geophysics comprised of high-resolution Magnetic Susceptibility, Magnetic Gradiometer and Earth Resistance surveys (O’Brien, Bonsall & Gimson 2009). These methods identified three concentric circular enclosing ditches or gullies and a pit circle at the centre of the fort, as well as smaller enclosing ditch-like elements, a linear field system which appears to pre-date the fort and outer enclosing ditch-like elements southeast of the fort. The presence of multiple ditches within Rathnadrinna may support the idea of a ceremonial / ritual role, supported by the quiet Magnetic Susceptibility and Magnetic Gradiometer results. Inside the fort a possible rectilinear enclosure was located at north, as are a series of ditches which may have guided access either directly to the pit-circle or around the fort, negotiating further enclosing elements before finally reaching the central pit-circle. 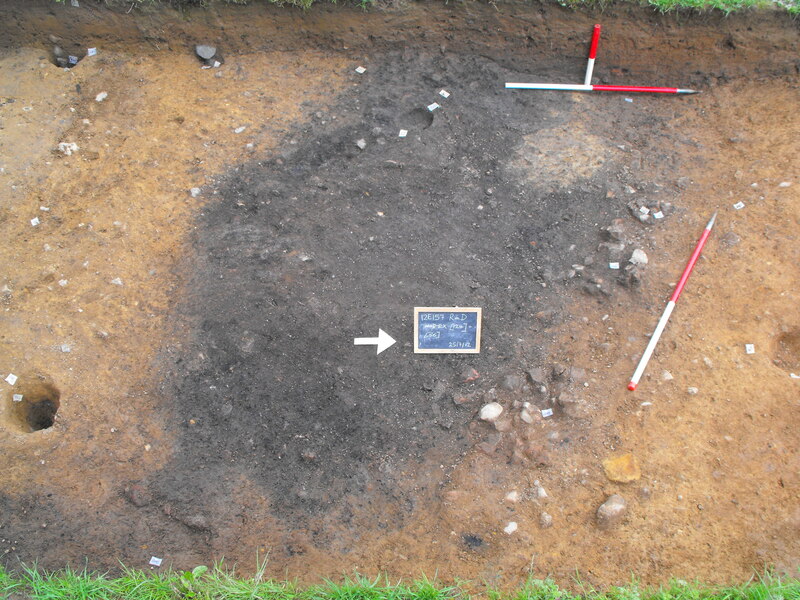 Contained within the pit-circle is a double row of postholes or post-pits in a rectangular formation – this may also suggest a defined access route or a potential structure? Ditches identified outside the fort in the magnetic gradiometer data, suggest that a boundary / access route leads from the boreen / laneway at the southwest, diagonally across to the northeast towards the entrance of Rathnadrinna itself. In 2010 the geophysics comprised of high-resolution Magnetic Susceptibility, Magnetic Gradiometer and Earth Resistance surveys outside the fort and Electrical Resistivity Tomography (ERT) surveys and selected topographical profiles through the fort (O’Brien, Bonsall & Gimson 2010). 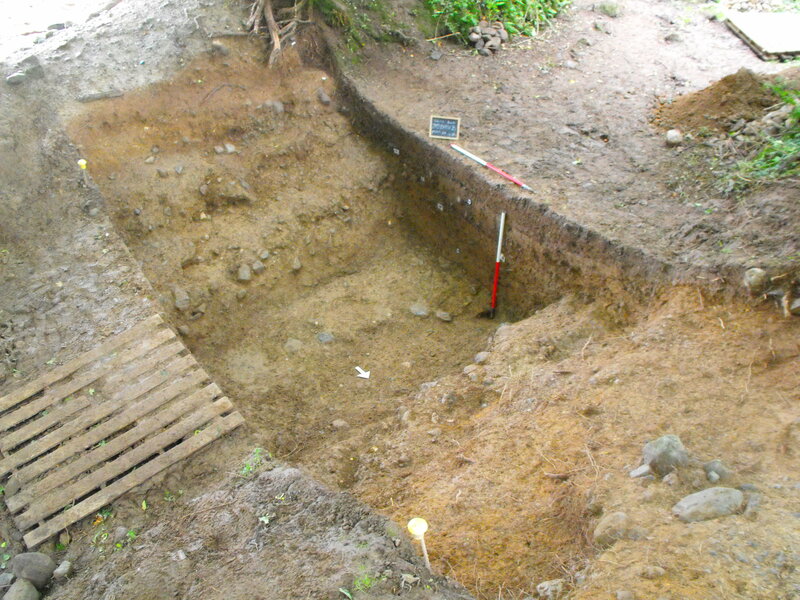 Each of the three ERT lines across the fort interior identified a layer of compacted material (c. 0.50 m deep) across the centre of the fort, and appeared to be enclosed by one of the internal circular ditches. What this layer might represent is debatable: could it represent an imported soil or the leveled remains of a large earthen mound or barrow? The compacted material could be masking geophysical responses to earlier, deeper, archaeological features which might include potential occupation activity. The Magnetic Gradiometer survey identified a 290 m linear anomaly [G1] that runs beneath the ramparts of the fort. This linear feature may be fossilized in the extant nearby field boundaries we still see today. The linear was aligned southeast/northwest, rising up the hill slope, over the plateau (through the fort) and down the far side of the hill – it clearly pre-dated the construction of the fort and could represent a very early field system / boundary within the landscape. In addition, both the Earth Resistance and Magnetic Gradiometer surveys mapped out a large 250 m diameter curvilinear enclosing ditch, located c. 50 m beyond the outer bank of the fort. This outer ditch with a perimeter of c. 820 m also included elements of an extant arcing field boundary and the sunken boreen; the ditch appears to have different sections comprising both double- and single-ditch elements. The double-ditch element, the most substantial part of the outer enclosure (and in its day, presumably a most impressive earthwork), was located on the west hill-slope, in full view of the Rock of Cashel. As the outline of the ditch follows the contour of the hill this would have added to the forts impressive defensive capabilities. A cluster of small circular ring-ditches and arcing ditches were found to the southwest of Rathnadrinna fort. Some lie within the limits of the new outer enclosure ditch whilst others lie just beyond it. The ring-ditches measure between 15 – 19 m in diameter and may represent foundation slot-trenches / drip gullies, surrounding wooden structures. Alternatively, they might represent ditches surrounding ploughed-out burial barrows. The Magnetic Susceptibility data also suggests an absence of burning activity – as observed inside the fort – perhaps discounting their use for settlement. If these features were burial monuments they may have a funerary role as a place of ultimate deposition rather than a site of pyre-burning or cremation activity, carried out elsewhere. 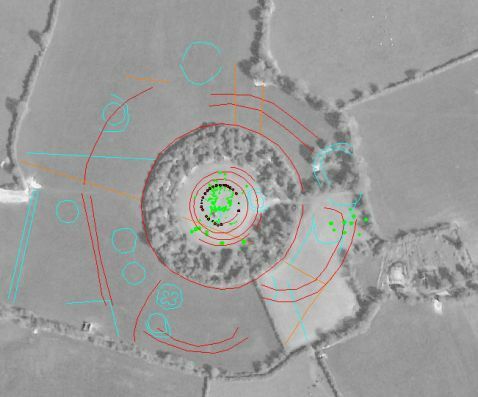 The Magnetic Gradiometer data also identified a 40 m wide circular feature, possibly a ploughed-out enclosure. In addition to the upstanding satellite fort (RMP TS061-08902) beside Rathnadrinna – its counterpart, located north and beyond the outer enclosure fort ditch, may represent another satellite fort. Such a close grouping of smaller forts around a larger pivotal fort has parallels in both the archaeological and historical records, where clients and sub-kings lived close to a seat of power. 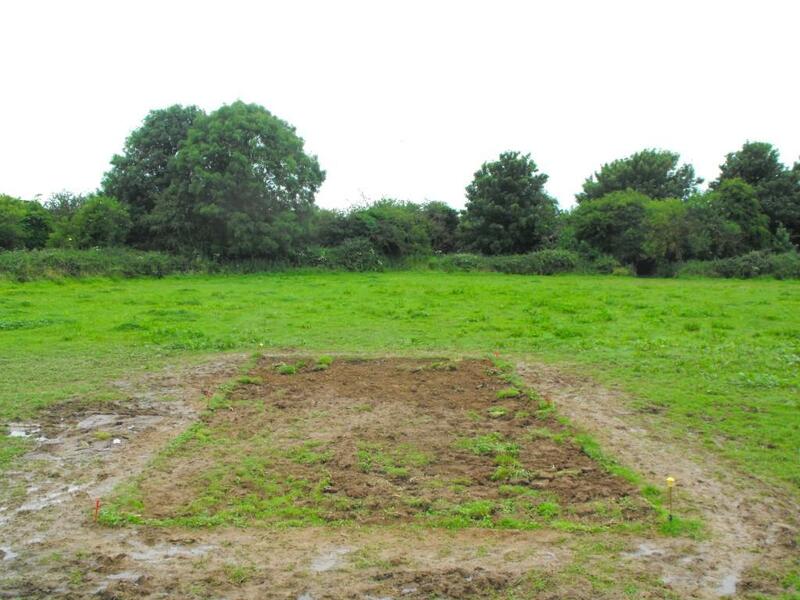 Relatively modern activity on the site has also been detected in the form of relict field boundaries, ploughing and an area of highly magnetic material to southeast associated with a late 19th century farm. Progress Report Season One 2012: The excavation commenced on Monday 11th June and ran for nine weeks until August 10th 2012. 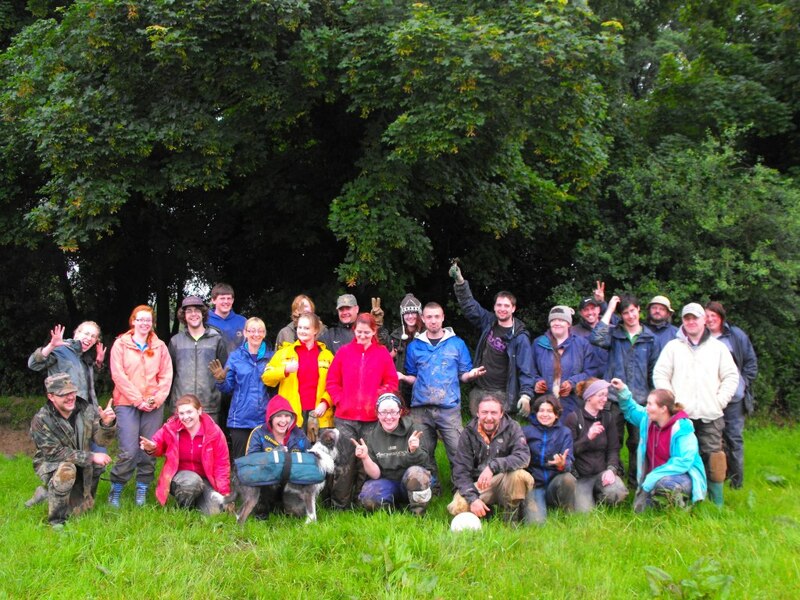 This timescale coincided with the wettest June on record, and as the weather did not improve in July, substantial delays occurred during the excavation. The excavation was staffed by volunteers, some of whom had archaeological experience and others did not. On-site training was provided by the supervisors. Cutting 1: This cutting measured 3 x 65 m (195 m²) and was orientated north-west / south-east. It was strategically placed along a portion of where the geophysical Electrical Resistance Tomography Line 1 (ERT1) had been located during the geophysical survey. 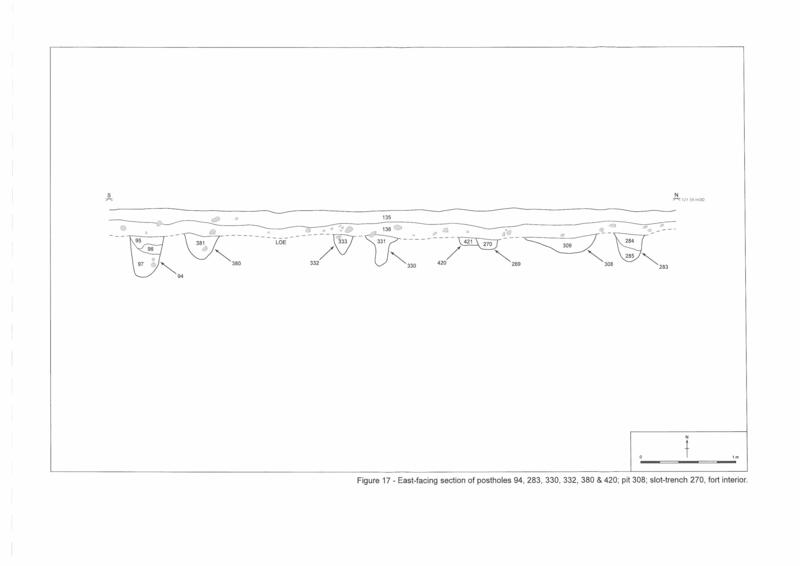 Cutting 1, Area A – Exterior of Fort (Figures 6–8): At its southern end Cutting 1 extended 17 m beyond the fort to identify the geophysical anomalies [G29] / [R16]. Anomaly [G29] was thought to represent an arcing ditch c. 30 m long; [R16] a curvilinear trend of low resistance c. 133 m long (O’Brien, Bonsall & Gimson 2009, Figures 6 & 16). 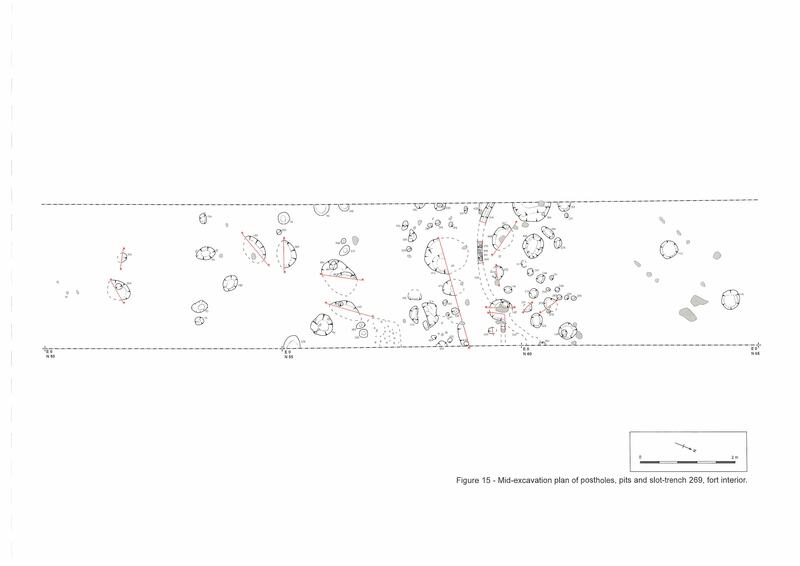 Upon excavation portions of anomalies [G29] / [R16] may have been identified as ditch , filled with (42), (205), (214) – (216) and ditch , filled with (52), (54), (125) & (217). 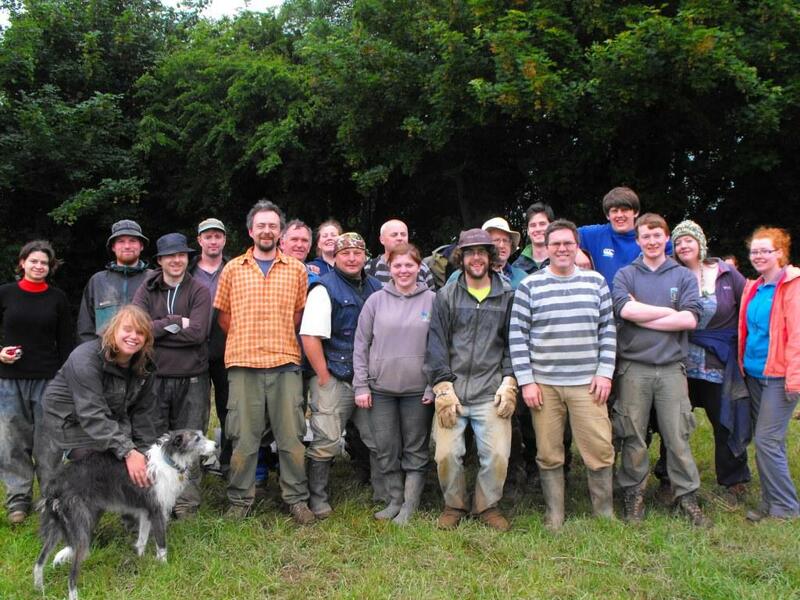 The fills of both ditches were sterile, silty clays and produced no finds. The primary ditch (41) appeared to be cut by ditch , perhaps representing an enlargement/realignment of the ditch. Once ditch  had silted-up it was cut on its southern side by posthole , filled with silty clay (204). This fill contained one charcoal fleck, although more may be revealed during environmental sampling: a pebble, 12E157:37, possibly worked was also retrieved from (204). Mid-excavation of features outside fort. On its north-western side ditch  was cut by a possible pit , which extended beyond the excavation baulk. Pit  was filled with reddish brown clay sand (90). There was a 0.05 m clay horizon between the upper ditch fill (42) and the base of this pit, although no finds or dateable material derived from this horizon. A sherd of blue transfer-printed fine earthenware from a large plate/dish, with floral pattern 12E157:52 was found in (90), although as the pit extended into the unexcavated baulk this sherd may have derived from the topsoil/sod. The relationship between these ditches and nearby postholes/stakeholes/pits found on either side of the ditches was unclear, although certain stratigraphic relationships could be made. 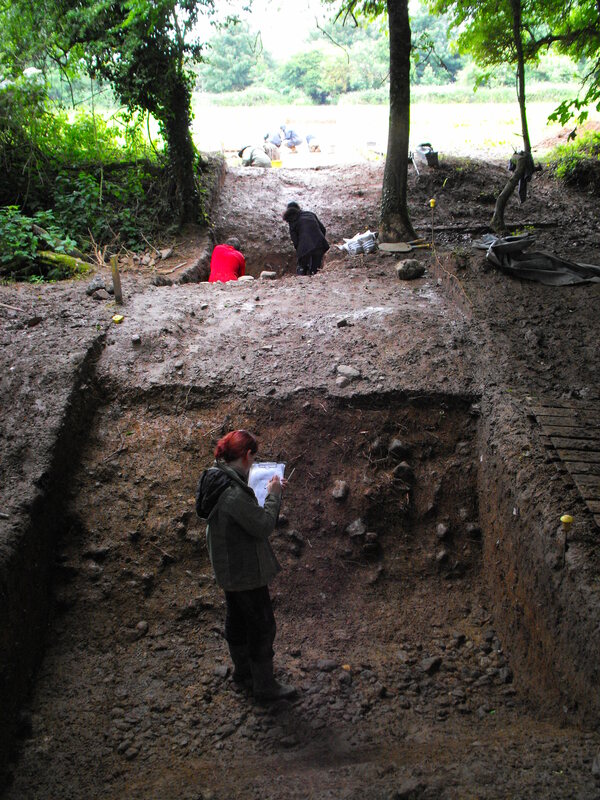 A number of features were identified between ditch  and the southern excavation baulk. These consisted of postholes , , , , , , , , , , ,  and ; stakeholes  and ; pits , , ,  and . These features generally consisted of sterile reddish brown silty fills. Pit , which only partially survived in the eastern baulk face, was filled with sterile silt (448). Following this event a stakehole  was placed in one corner of the pit. This was sealed by silty sand containing charcoal flecking (435). After this event posthole  was cut through pit ; the posthole contained charcoal in its fill, (290). Pits  and  were inter-cutting. Posthole  contained a possible post-pipe . 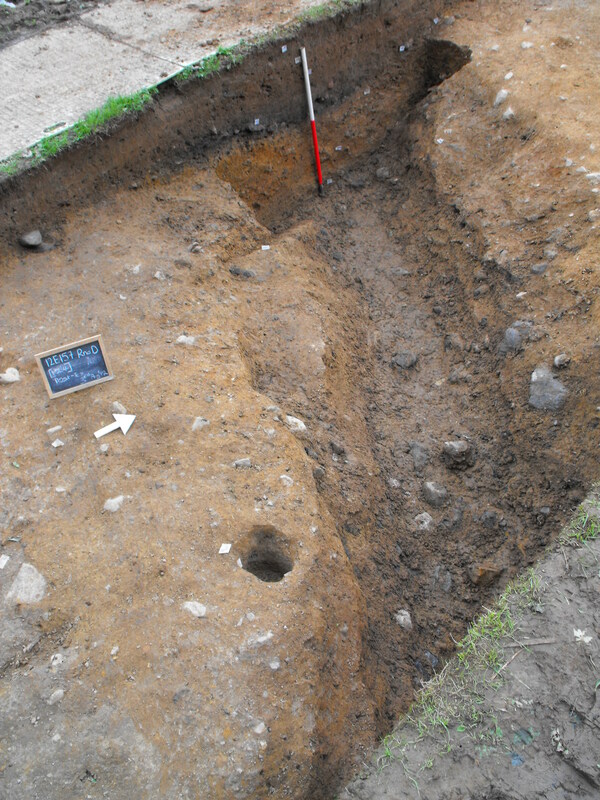 Posthole  was V-shaped in profile as was another posthole,  located north of ditch . 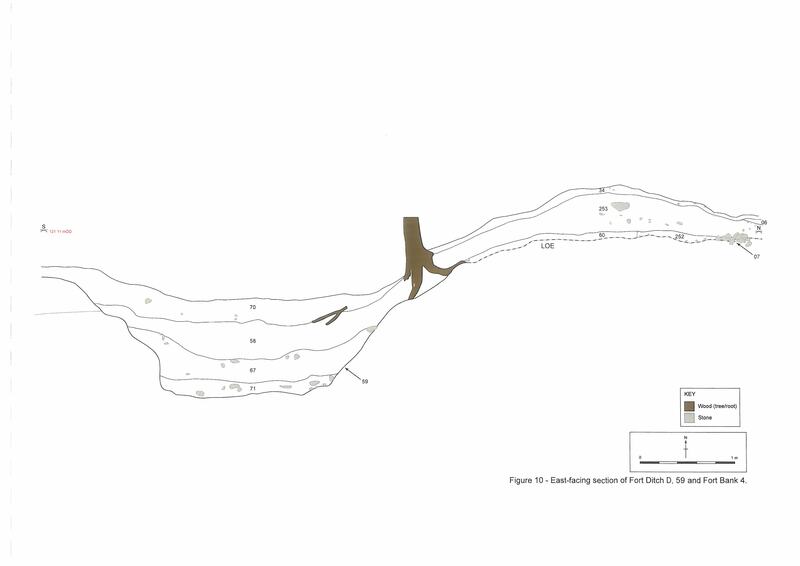 In this area further cut features were identified consisting of postholes , , , ,  and , possible slot-trench , with associated fill (311) and packing stones (312), stakehole , and pit  which had been partially sealed by a nearby deposit of reddish brown clay silt, possibly heat-affected (251)? These features may have been associated with extra-mural settlement beyond the fort, or associated with much earlier (prehistoric) settlement on the hillside. 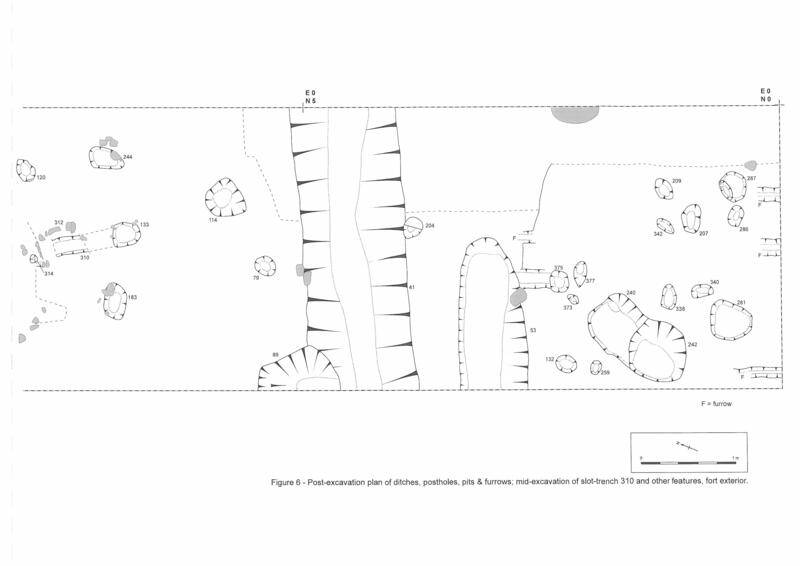 Some of the postholes may have formed one portion of a structure and the possible slot-trench, although narrow and shallow, may be indicative of some structural form outside the fort, perhaps associated with the kiln nearby (see below). 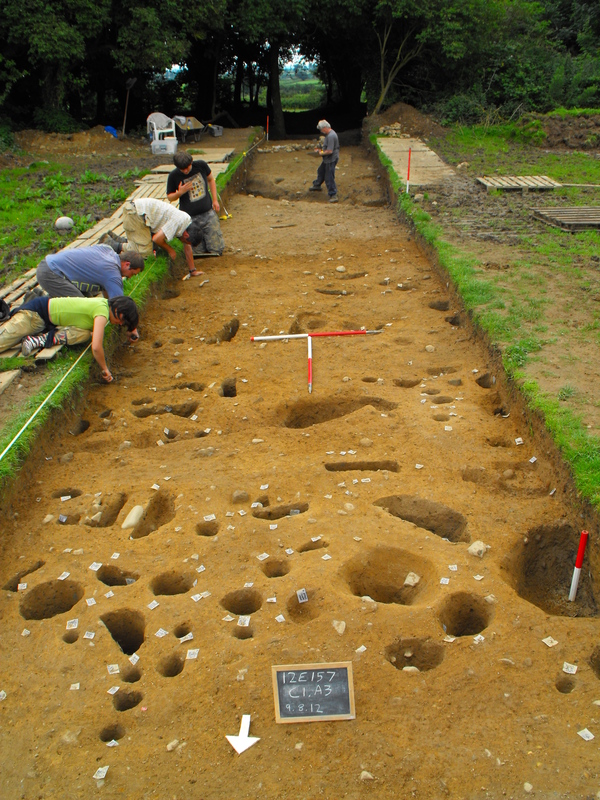 The full excavation of this slot-trench and some of the nearby features is planned for Season Two. 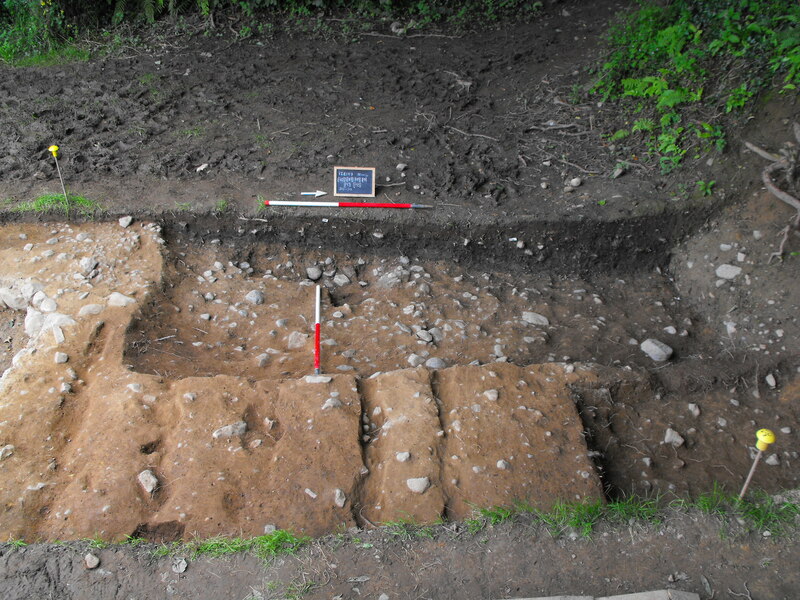 A stone-lined cereal-drying kiln  was found about 5 m from the fort bank. Its upper courses (38) had been largely removed from ploughing. Traces of nearby stone metalling (03) may have been a working surface? The flue was traced by Earthsound Archaeological Geophysics beyond the excavation to the east using magnetic susceptibility surveying. The bowl contained two fills (68), sealed by (08). At the kiln base posthole  was found; this may have functioned as a wooden baffle? The kiln was fully excavated and produced in situ charcoal, burnt clay and an unidentified iron object (12E157:15). This artefact suggests the kiln was either Iron Age or Medieval in date. On the other excavated forts around Cashel the cereal-drying kilns have been dated to between the 6th – 12th centuries AD. The kiln had not been identified on the geophysical survey, perhaps as it had been back-filled with the surrounding soils? Nearest the base of the fort bank a pit was found , filled with all kinds of rural domestic materials, such as butchered bones, iron, coal, egg shells, leather, hobnail shoes, nails, pottery, clay pipe fragments (05). One interesting find was a copper alloy book clasp (12E157:19). This midden material represented domestic dumping from one of the nearby houses to the south of the fort, and may have happened as recently as the middle of the 20th century. 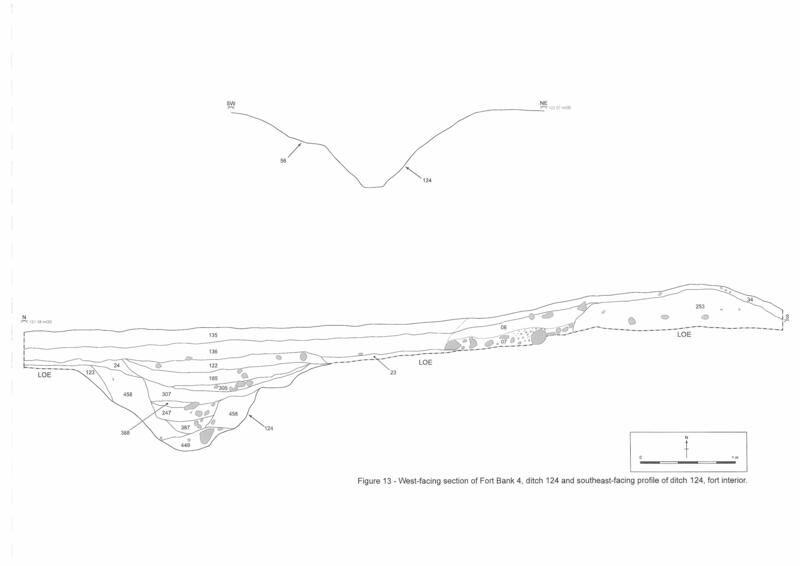 Cutting 1, Area B – Through the Ramparts (Figures 5, 9–10): Cutting 1 continued through the banks and ditches of the fort to reveal how and when these earthworks were formed. There was slight evidence for an outer fort ditch , although the midden deposit and ploughing had disturbed this area greatly. Ditch  contained a single sterile fill (45), from which sherds of delph were found near the top (12E157:38 –12E157:39). The ditch was c. 1.7 m wide and c. 0.50 m deep. Stone surface (21) over Bank 2, facing north. Three of the banks contained stone surfaces which partially extended into the ditches. As no dating evidence was found under these surfaces it is proposed to partially section each bank in Season Two. Bank 3 appeared to consist of cultural material in the form of burnt stones (119), and a single posthole  containing charcoal-rich fills (32) and (145) had been cut into the burnt stones. Stone & clay deposit (63) in the upper layers of Ditch B, facing west. Bank 1 is at left. Post-excavation of Ditch B, facing southwest. The stepped profile of the internal face of Bank 1 is visible at left. 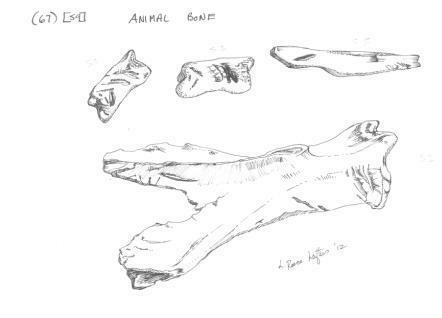 Each of the three fort ditches excavated produced cultural material in the form of stratified animal bones in small quantities; in particular the innermost Ditch D, which contained leg bones, teeth and a clavicle probably from a cow. Ditch B , the outermost fort ditch contained the most fills – (14), (36), (46), (63), (98), (99), (128), (129), (130), (148), (149), (246) & (471). Fill (99) contained animal bone but it may have been deposited from one of the roots of the trees on Bank 1, and could be intrusive. A number of these were stone-/gravel-rich deposits (130) and (149) laid against the internal face of Bank 1, which itself had a stepped profile. These deposits may have been to strengthen the bank or could represent landscaping features associated with the trees planted on the site. 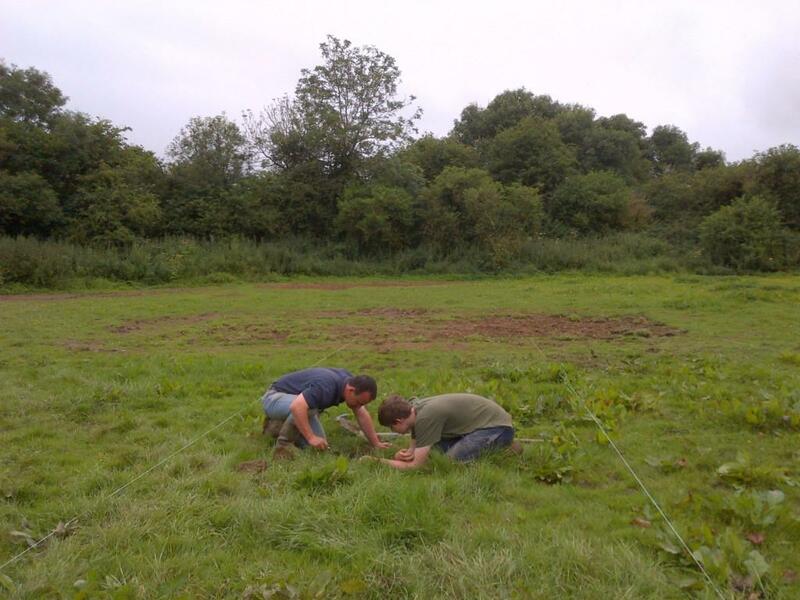 The ditch was c. 3 m wide at the top, narrowing to c. 1.24 m at the base and was c. 1.10 m deep. Ditch C  consisted of a silt layer (72), sealed by a layer of tightly-laid stones (62); sealed by a deep clay deposit (51) with occasional stones; sealed by orange-coloured clay (29), probably bank material and sealed by the uppermost deposit of clay and humic material (17). A fragment of burnt bone retrieved from deposit (51) is probably insufficient for dating purposes. 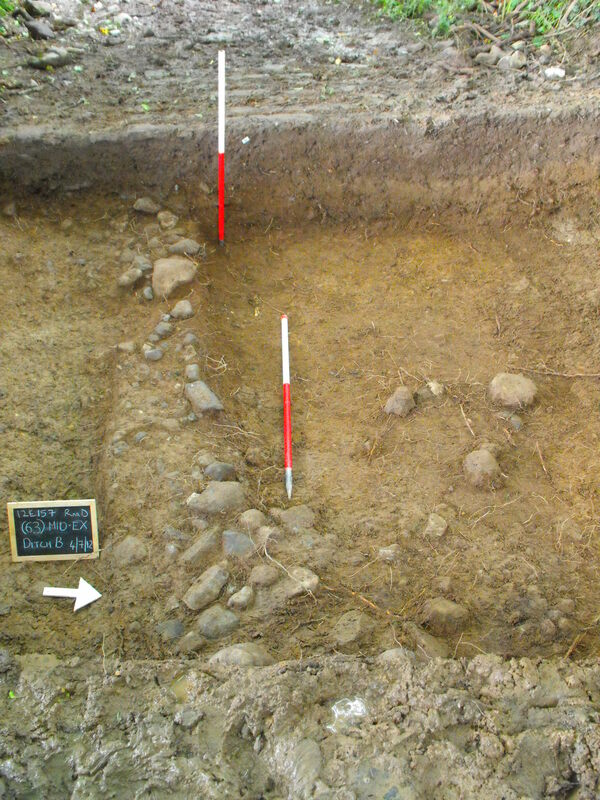 However a localised lens of charcoal-rich clay (55) was found within deposit (51). 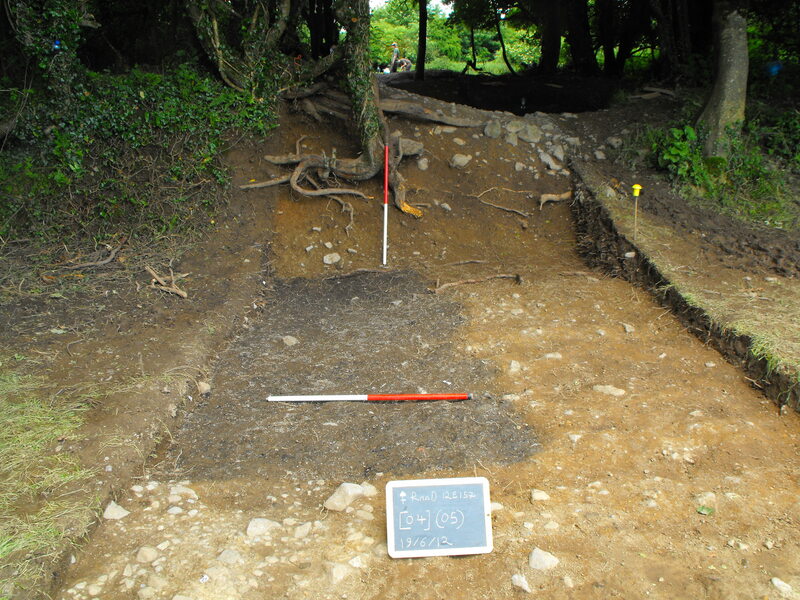 Dating charcoal from (55) will allow the sequence of events within this fort ditch be established, allowing comparison with proposed dates from the innermost ditch . Such dates should indicate whether the fort ditches are contemporary. Ditch C  was c. 3 m wide at the top, narrowing to c. 1.2 m at the base and was c. 1.08 m deep. The innermost fort ditch  consisted of four fills: a basal deposit of sand (211); sealed by a clay and stone-rich deposit (71); sealed by a deeper clay deposit (67); sealed by a deeper layer of orange clay and sand, probably bank material (58); sealed by the uppermost deposit of clay and humic material (70). 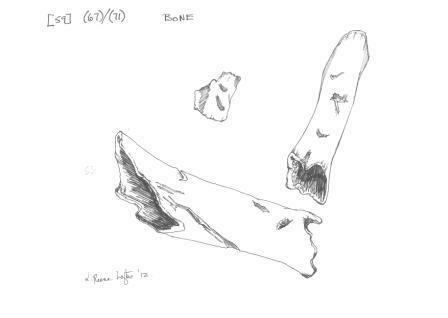 Found within the lower deposits (71) and (67) were animal bones, probably bovine many of which had been butchered. 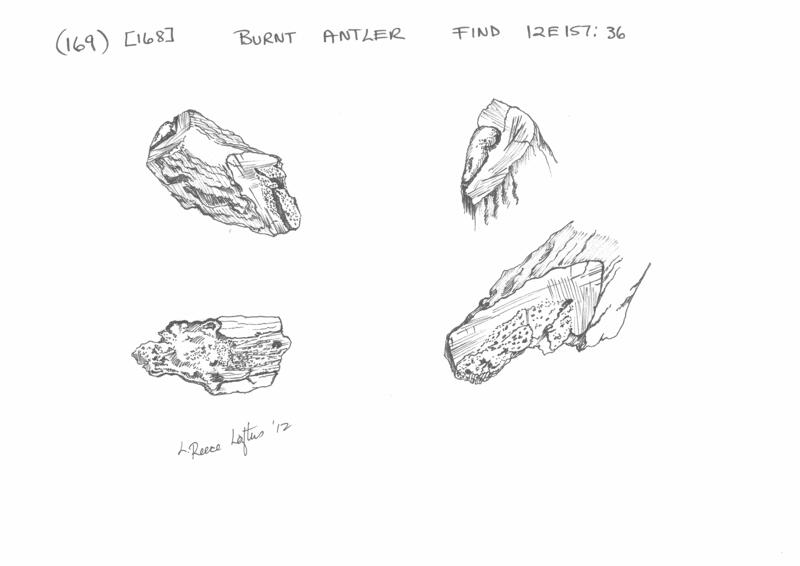 It is proposed to date the animal bone from basal deposit (71). The ditch, at this location exhibited no evidence of recuts. The frequency of stones amongst the basal deposits (67) and (71) were suggestive of being dumped into the ditch, perhaps from the fort interior? A lead pistol shot (12E157:18) was found in upper fill (58). 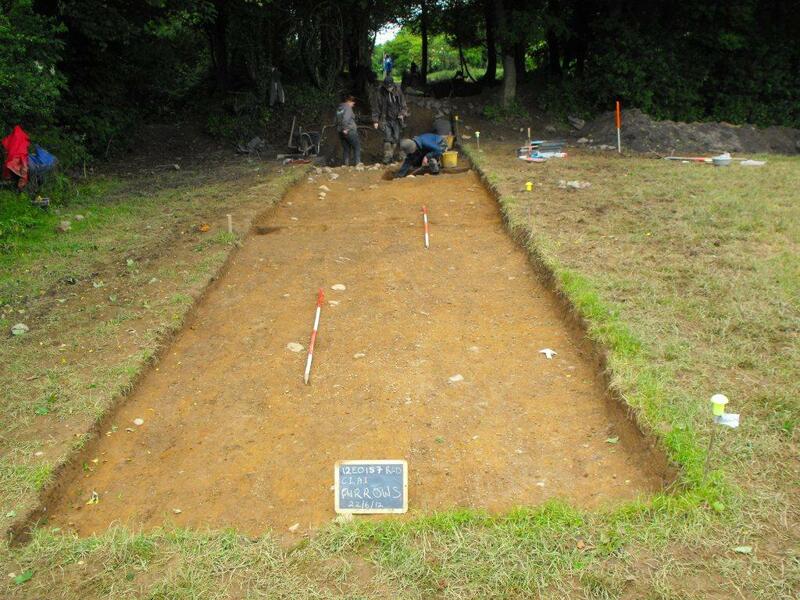 Ditch D  was c. 3.5 m wide at the top, narrowing to c. 1.2 m at the base and was c. 0.96 – 1.20 m deep. The ditches had been cut into the underlying gravel, were generally flat-bottomed at the base and the sides sloped gradually up to the banks. The ditch bases were lined with densely packed stones and the ditch fills were very similar consisting of homogenous clays. 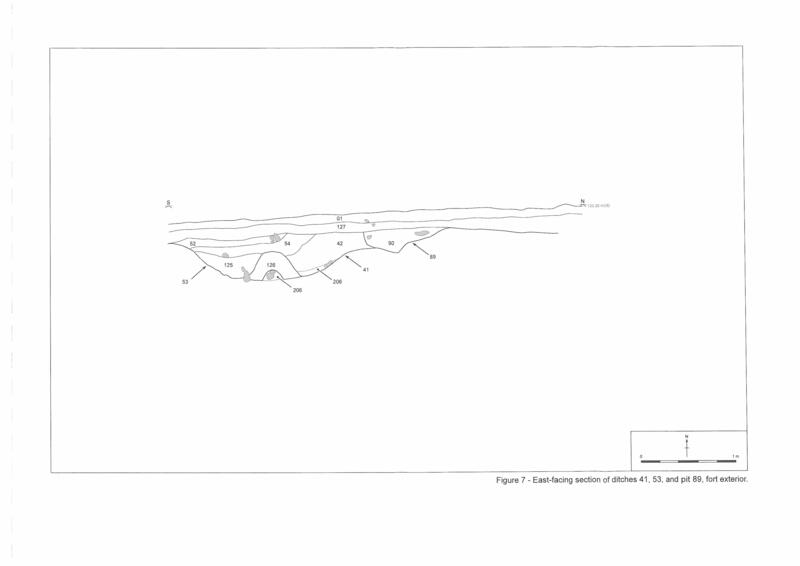 Cutting 1, Area C – Interior of Fort (Figures 11–18): The cutting continued into the centre of the fort to target anomaly [G1], a strong magnetic anomaly interpreted as a linear ditch crossing the southern portion of the fort interior (blue line on Figure 3). The ditch measured 65 m in length and appears to be associated with a trend of magnetic susceptibility [M1] (see below). The ditch runs between the internal banks of the fort and appears to continue beyond them into the southern field (as anomaly [G14]), forming part of a possible extensive field system. 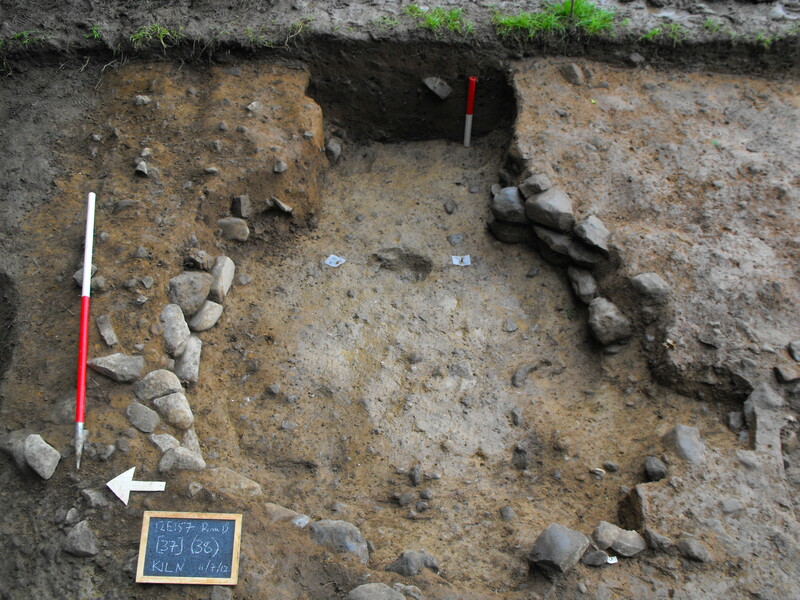 As this interpretation suggests that the ditch and possible field system of [G1 / G14] predates the construction of the fort, the excavation of this ditch feature was of critical importance to the understanding of the chronology of the fort. 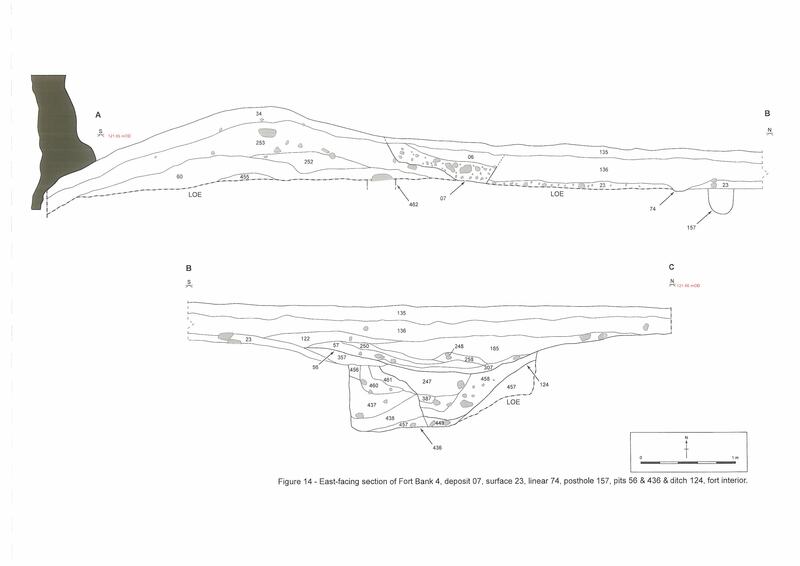 The excavation identified anomaly [G1] as a flat-bottomed V-shaped ditch , 2.8 m wide and c. 0.70 m deep, orientated southeast/northwest and filled with sterile fills in its’ base. Post-excavation of the pre-fort ditch , showing its truncation of pit  (at top), possibly one of the geophysical pit/post anomalies? Ditch  was completely different in form and shape to the fort ditches. However, the excavation established that an earlier pit  had been cut by the ditch (Figures 12–14). Pit  was only partially exposed in the western baulk but was filled with sterile fills (437), (438), (449), (456) and (458). It appears the pit may have been back-filled soon after it had been dug. Such truncation of earlier deposits mirrors what was found on the fort exterior in Cutting 1, Area A. Once ditch  was created it truncated pit  and began to silt up (387) and (247). A later fill (388), the earliest charcoal-rich deposit in the ditch will be radiocarbon dated. The upper ditch fill appeared to have been cut by pit , cut into its southern side. This pit was filled with an abundant charcoal-rich deposit (57) containing burnt stones and animal bones. There were abundant heat-affected stones, although no evidence of in situ burning was found. Dating this burnt bone from (57) will provide a terminus date for ditch . Is pit  contemporary with activity in the fort ditches? On either side of ditch  were a number of postholes which did not form any pattern. Three stakeholes ,  and  and posthole  found on the southern side of the ditch were filled with charcoal. Stakehole  was found beside and to the north of the ditch while posthole  had cut through the uppermost ditch fill. Found within this posthole from fill (169) was cremated bone and one piece of antler with cuts on four sides (12E157:36). Pit  was also cut into ditch  deposits and burnt bone was found from its fill (306). A number of thin linear features also located here were orientated similar to the ditch and filled with sterile fills  and . However, it was noticeable that between this early ditch and the fort bank there was sparse evidence of occupation. The ditch was sealed by deep plough soil-type clay (165) that extended from this ditch toward the innermost bank of the fort, which may correspond to anomaly [M1], a curvilinear trend of negative magnetic susceptibility. 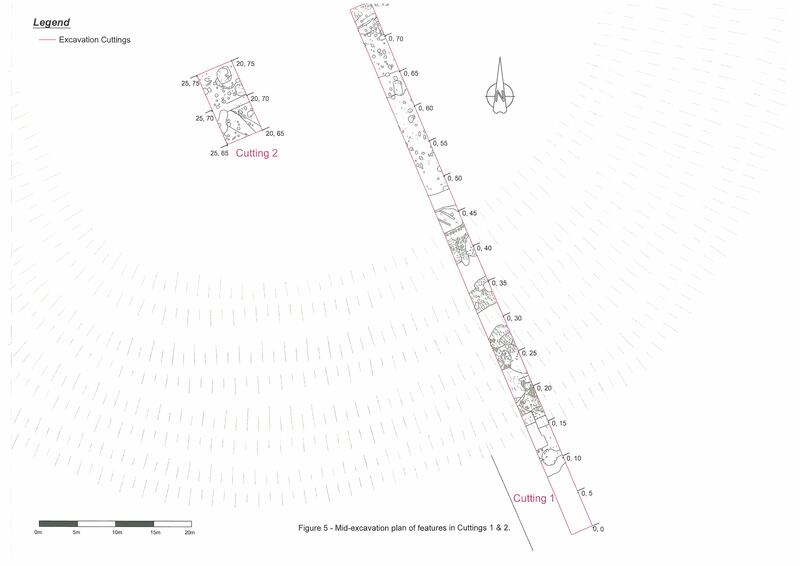 The northern end of Cutting 1 was designed to target a number of anomalies [R2], [R3], [R4] and [R5] which have been interpreted as representing a series of concentric circular features, perhaps pit circles within the fort (red curving lines on Figure 3). This area also contained a feature comprised of compacted earth or stone [ERT7], measuring c. 70 m in diameter, represented by a 0.5 m thick layer of compacted material enclosed by a circular ditch. 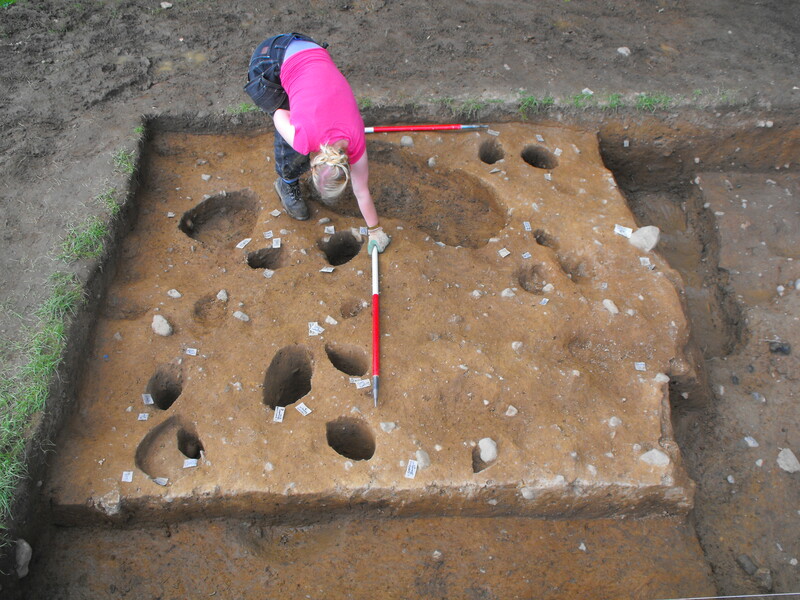 Upon excavation the interior of the fort was characterised by a multitude of postholes, stakeholes and pits, with a number of arcing slot-trenches, including , partially defined by stakeholes , ,  and  (Figures 15, 17–18). Unfortunately, there was no cultural material from these features apart from occasional charcoal flecks from a couple of pits. This will make the dating of these features difficult. 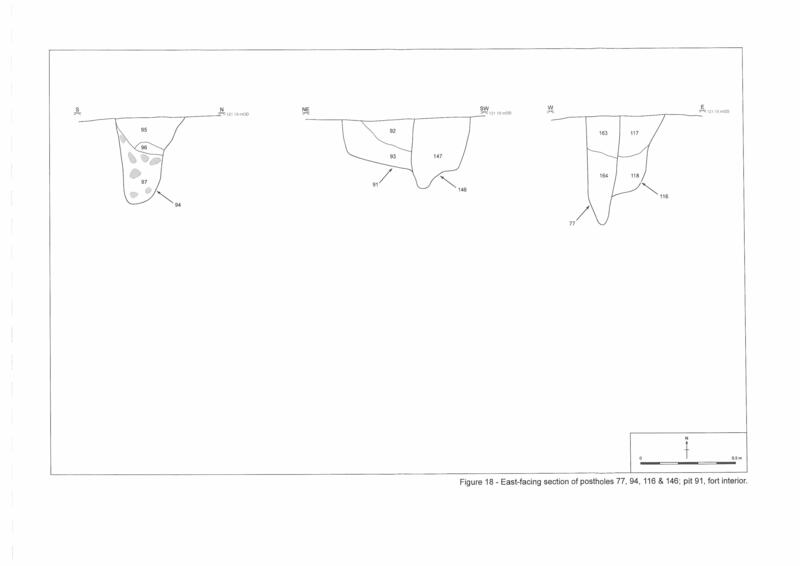 Clearly some of the postholes were substantial enough for load-bearing posts of a structure, and in places arcing lines of posts were obvious (Figure 18). None of the postholes contained substantial packing stones. As was noted outside the fort some features exhibited clear stratigraphic relationships, for instance, posthole  was cut by post-pipe . Nearer to the centre of the fort a number of linears that were surveyed but remained unexcavated may equate to some of the anomalies found in the geophysical survey. Due to the number of features identified and the inclement weather conditions it was decided to record the features in pre-excavation plan, and excavate as many as possible between Grid E0, N55 – E0, N65. 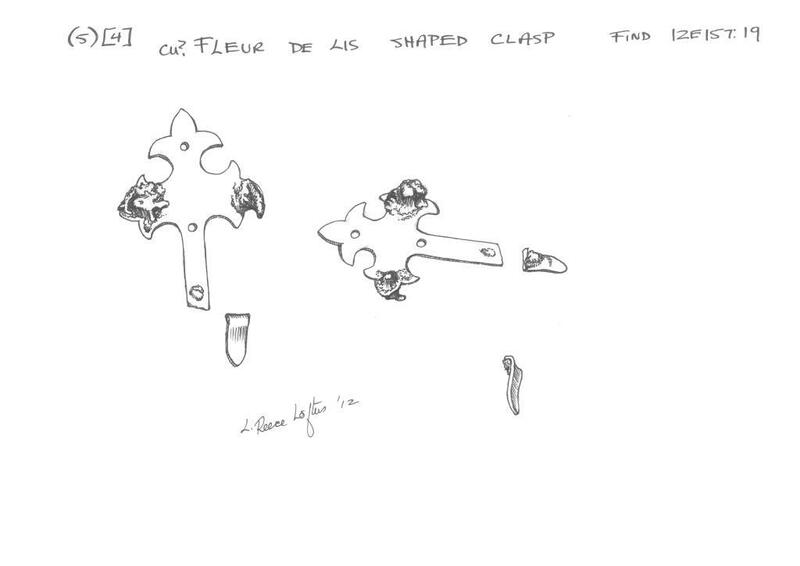 Could the features shown on Figure 15 be cut into the compacted soil [ERT7]? If so, further archaeological layers should be encountered beneath these features and therefore the completion of this area is a priority for Season Two. Cutting 2: This cutting measured 10 x 25 m (250 m²) and was orientated south-west / north- east, its northern terminus meeting the north western edge of Cutting 1. The cutting was positioned with the longer axis to target as many of the geophysical anomalies as possible, including catching some of the same geophysical anomalies as in Cutting 1. For instance, portions of the ditch anomaly [G1], and the concentric circular feature [R5], thereby allowing comparisons of the ditch data in both cuttings, and increasing the likelihood of discovering further dating materials. Upon excavation only a 5 m x 10 m area was opened up, down to the upper surface of the archaeological features. A horseshoe from a large draught horse (12E157:06) found at the base of the topsoil, and bits of ploughs indicated horse-drawn ploughing had occurred in the interior of the fort. 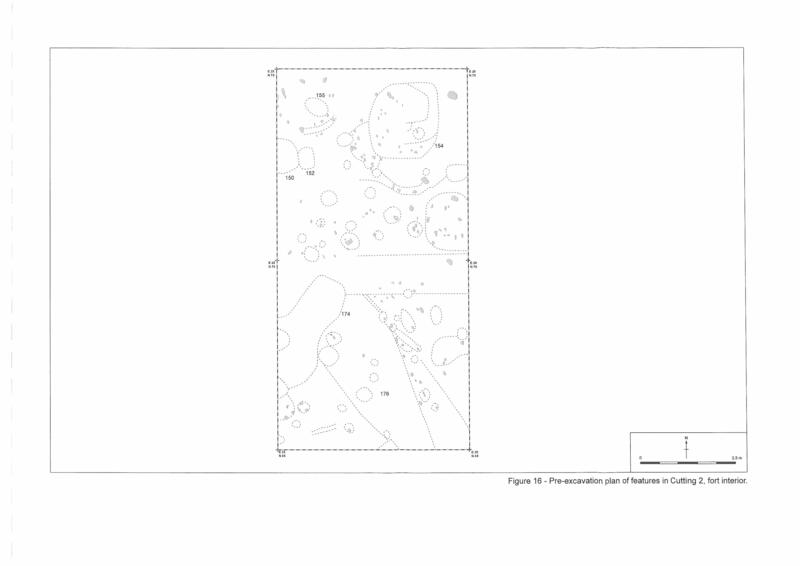 Cutting 2 was found to contain the same multitude of postholes, stakeholes and pits as identified in Cutting 1, Area C. Due to the number of features identified and the inclement weather conditions it was decided to record the features in pre-excavation plan only, and partially excavate a sub-sample of features to derive dating material. 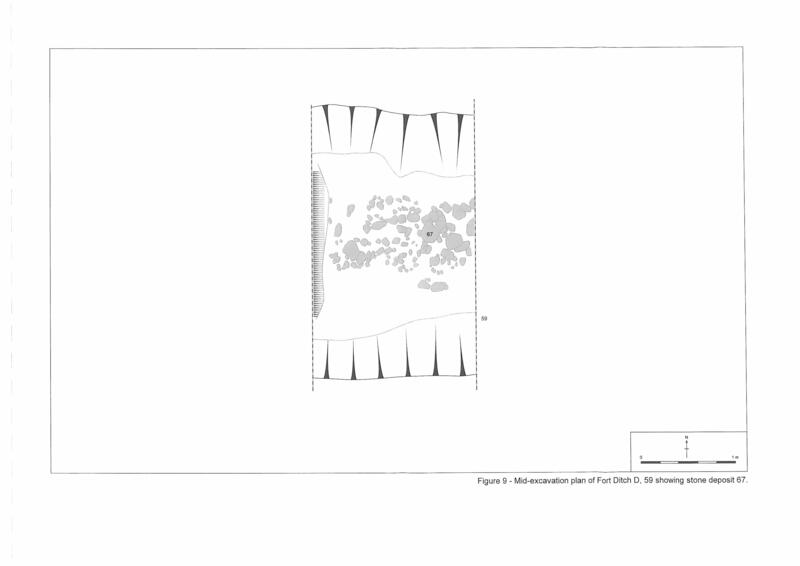 A number of postholes were sectioned and samples of charcoal (176) were taken from a linear , which may equate with the pre-fort ditch anomaly [G1] / , in Cutting 1, Area C. Feature (154) was a shallow silty deposit which sealed postholes  and , and resembled some of the shallow deposits noted in Cutting 1, Area C. Posthole  appeared to be deliberately back-filled with re-deposited material (156). Season Two will focus on the full excavation of many of these features in particular verifying the nature and depth of the large postholes. All archaeological features were sampled with the fort ditches, kiln, old ground surfaces and pre-fort ditch fills bulk sampled. 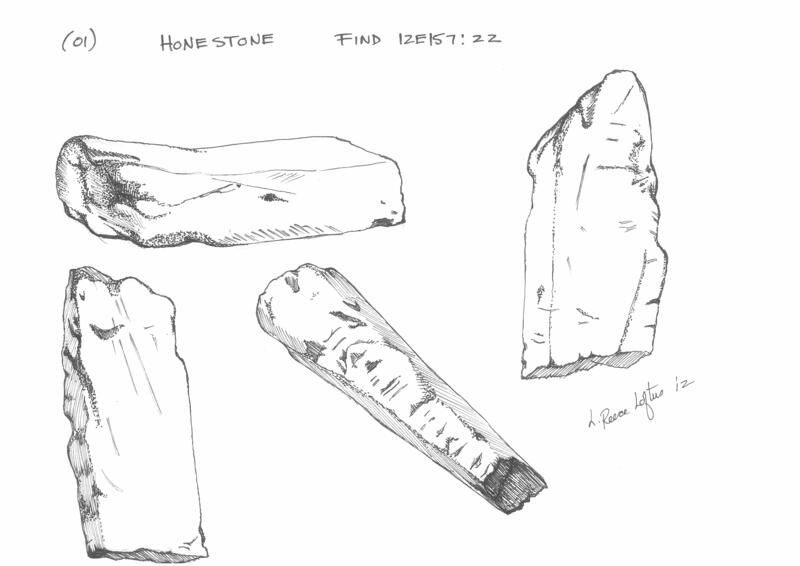 Apart from the artefacts found in the early modern midden deposit the bulk of artefacts recovered were lithics, in the form of chert and flint nodules and flakes. This could support the notion that a prehistoric horizon(s) exist on the hillside. 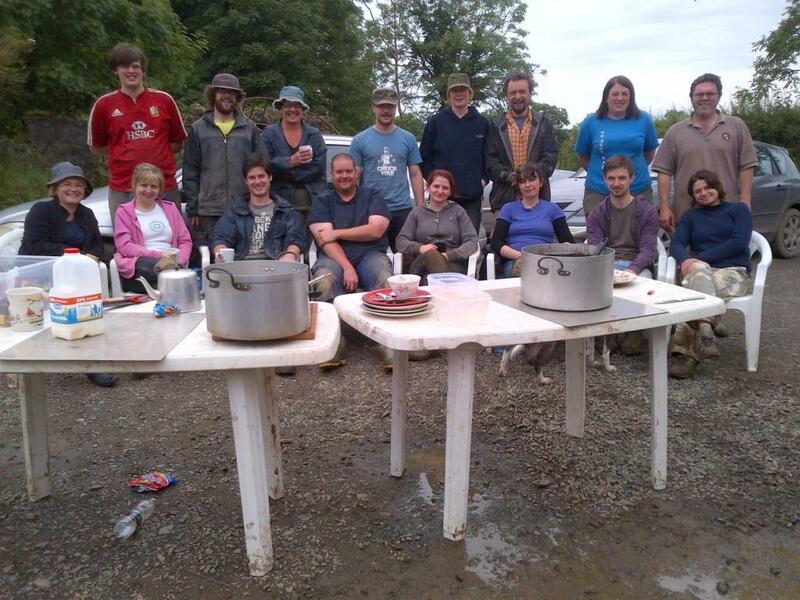 The soil sieving and metal detecting of archaeological soils have so far revealed no other artefacts. There was a distinct lack of metal objects on the site and no slag was found. 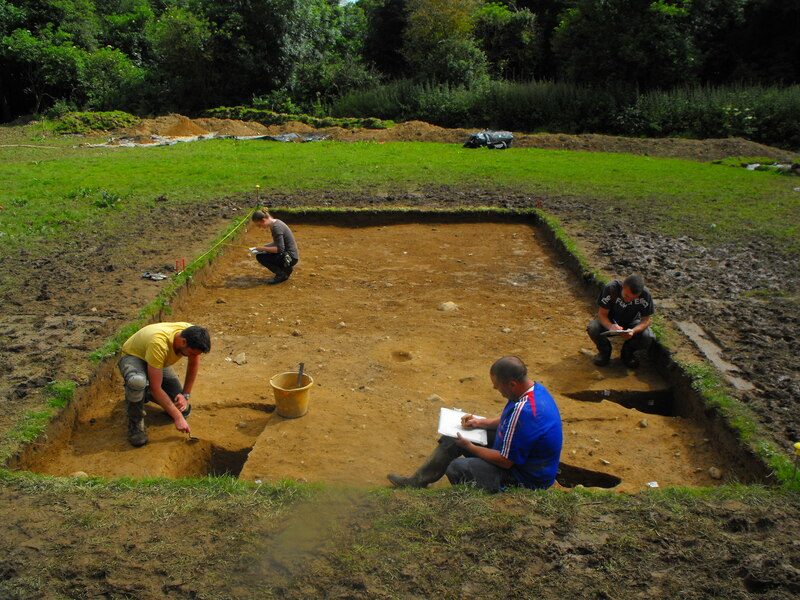 At the conclusion of the excavation all archaeological features were sealed by terram and then backfilled with soil. Proposed Radiocarbon Dates: Four radiocarbon dates have been approved by the Royal Irish Academy for submission to QUB in 2013: charcoal from lower fill (388) within ditch ; cremated bone from fill (57) of pit , which cuts ditch ; charcoal from lower fill (55) of Fort Ditch C ; and animal bone from basal layer (71) of Fort Ditch D : these results should be back in late 2013. 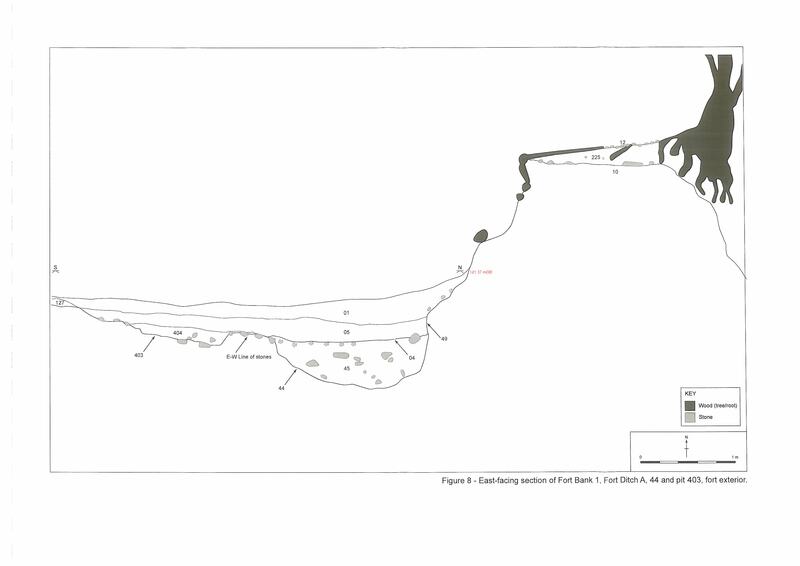 Cutting 1a – Exterior of Fort: This cutting will be re-opened between Grid Points 0,5m – 0,10m measuring 3m (EW) x 5m (N/S), 15m². It will target the area south of kiln  and ditches  / , in order to complete the excavation of the potential slot-trench feature , stone deposit (465) and nearby posthole/stakehole features. Cutting 1b – Fort Ramparts: Cutting 1b covers the areas of the fort banks and ditches. It is not proposed to re-open any of the fort ditches. It is proposed to place a section through each fort bank in order to accurately determine how each bank was constructed and, hopefully, to get some dating evidence as to when the banks were erected. Cutting 1c – Interior of Fort: This cutting will be re-opened between Grid Points 0,55m – 0,65m measuring 3m (EW) x 10m (N/S), 30m². It will target the area of intense posthole/stakehole/pit activity revealed in Season One, and now proposed for full excavation. Cutting 2 – Interior of Fort: This cutting will be re-opened between Grid Points 20,70m – 25,75m measuring 5m (EW) x 5m (N/S), 25m². It will target the area of posthole/pit activity revealed in Season One, and now proposed for full excavation. At least one of these features, posthole  may equate to one of the large pits/posts revealed in the geophysics as possibly forming a pit circle (large red dots on Figure 3). The excavation will determine whether these features, many of which were sterile, were cut into natural or into the top of earlier deposits, which the geophysics surveys have suggested exist within the fort. Conclusion: Rathnadrinna fort and its environs have proved to be ideal for archaeological investigation. The use of multiple high resolution non-invasive techniques has revealed a very complex, multi-period monument of major archaeological significance. The complexity of the features revealed is comparable to findings from other Irish royal sites such as Navan Fort, Dún Ailinne, Cruachan and Tara. Indeed, the large hillfort ditch mirrors similar findings from Haughey’s Fort part of the Navan Fort complex, where a 350 m ditched enclosure was dated to the Late Bronze Age. 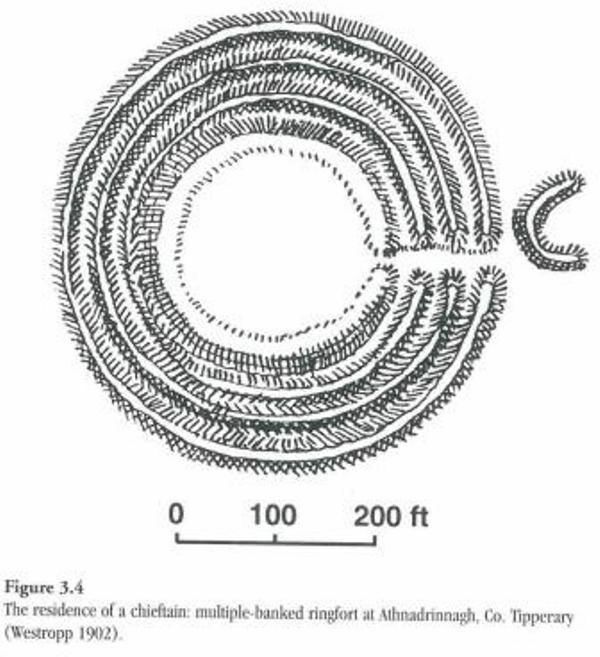 Within Rathnadrinna fort itself the intriguing compacted layer and the multiple pit circles / ditches may have parallels at Navan Fort (Site B) where a clay mound (6 m high and 50 m wide) had been constructed over a cairn and multi-ringed timber structure (Lynn 2003, 24–5). The constant use and re-use of the summit could represent deliberate destruction or cleansing acts, making way for new local elites. The multiple posthole, stakehole and pit features discovered within the interior of the fort may mask the true nature of the compacted soil on the site. The full investigation of this stratum is critical to the whole understanding of the site and it is proposed to concentrate works here in Season Two. 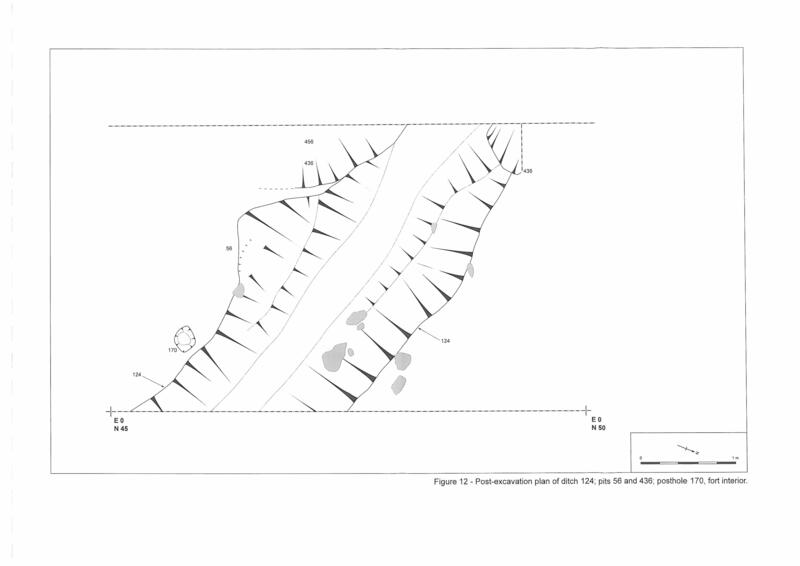 The excavation of the pre-fort ditch , and its proposed dating should allow comparisons be made with similar such linear features on other significant sites. Turning to the monument we behold today, its sheer size, the construction of the multi-vallate banks and ditches, combined with the elaborate entrance avenue allow parallels with other royal forts. There is a suggestion that there may be phasing of the bank and ditch construction as the inner two banks, 3 and 4 are much more denuded, and cultural material occurs almost near the present ground surface (present surface of Bank 3). The outer two banks, 1 and 2 are much more substantial, and may exhibit traces of later manipulation, in the form of metalled surfaces/landscaping along their summits. The further investigation of these banks in Season Two will attempt to reveal the nature of this complex site, and assist in its’ interpretation within the royal landscape of ancient Cashel. 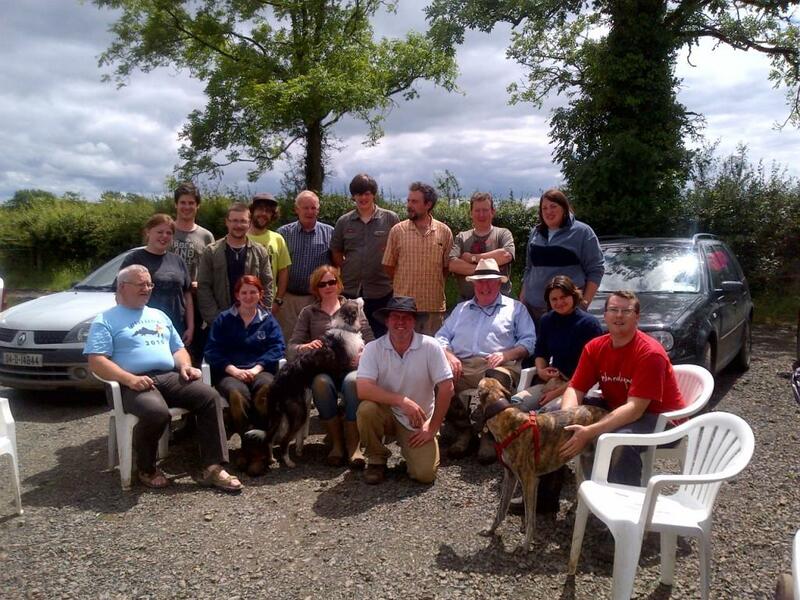 Acknowledgements: The Season One fieldwork took place between 11th June and 10th August 2012 and was directed by Richard O’Brien, supervised by Micheal Ó Droma, Heather Gimson, Marcella Loughman and Jim Crane. Thanks to Lynne Reece Loftus for illustrating some of the finds and to Jonathan Millar of Rubicon Heritage Services for the graphics. 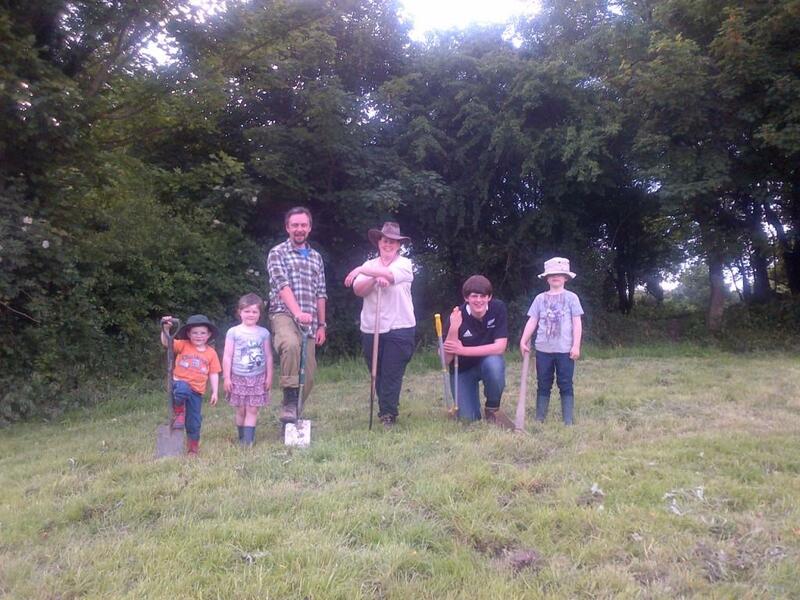 Thanks to Tom & Margaret Horan for permission to dig, and to all the volunteers who gave of their time and will continue to do so during Season Two. O’Brien, R., Gimson, H. & Bonsall, J. 2011 ‘Revealing royal Rathnadrinna’, Current Archaeology, 26-33. Issue 259. Selkirk Publishing, London. This post is dedicated to the memory of John P. Knightly (NT) historian, teacher and friend. Just admiring your site. Did you get any C14 dates yet? I was just wondering if you have any evidence of this site dating to the iron age? Thanks for the message. I hope to have my four dates back from QUB in March, so will let you know of the results. 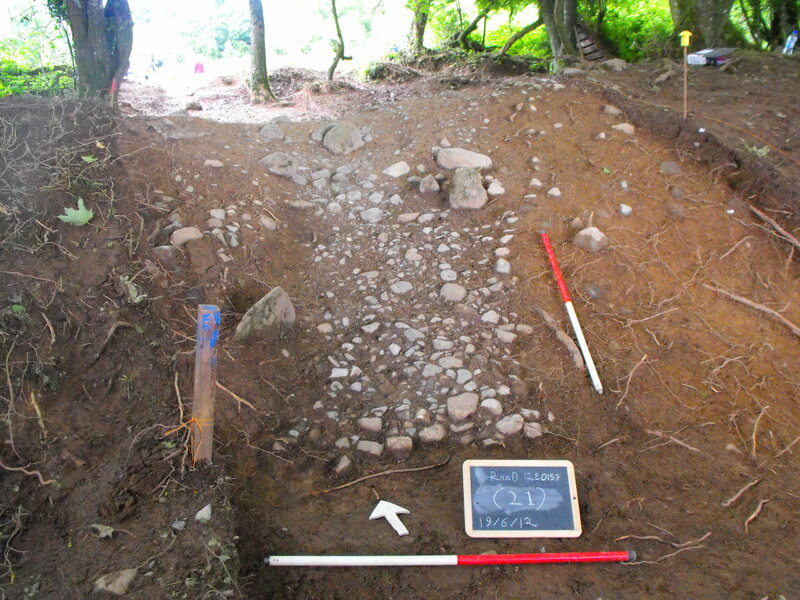 Last summer we got an Early Bronze Age arrowhead (ex situ), and we have evidence under three of the ramparts for pre-ringfort activity. I hope to get this activity dated in the next batch of RIA-funded dates, all going well. I was actually reading your ringfort book earlier today trying to find data on measuring circularity – can you help me out?